(Nanowerk News) The Dresden High Magnetic Field Laboratory at the research centre Forschungszentrum Dresden-Rossendorf (FZD) provides highest magnetic fields for materials research. Here, physicists at the Walther Meissner Institute of the Bavarian Academy of Sciences and Humanities (Garching) conducted very precise measurements, discovering hitherto unknown metallic properties of high-temperature superconductors. The results, presented recently in the journal Physical Review Letters, have met with a great response in the scientific community ("Evolution of the Fermi Surface of the Electron-Doped High-Temperature Superconductor Nd2-xCexCuO4 Revealed by Shubnikov–de Haas Oscillations"). 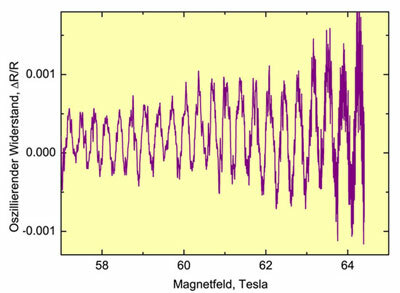 The Dresden High Magnetic Field Laboratory provides research with pulsed magnetic fields of up to 70 Tesla with great reliability and has thus made a name for itself with scientists from all over the world. This time guest researchers from Garching, Bavaria, came to perform measurements. Professor Rudolf Gross' research group brought with them optimally prepared samples of a complex cuprate - a compound of copper, oxygen and other elements - in order to finally confirm or debunk contradictory theoretical concepts on the nature of high-temperature superconductors. The field has been waiting for such kind of measurements for about two decades, since high magnetic fields of more than 60 Tesla, combined with refined experimental techniques at excellently equipped laboratories, are still a novelty. When it comes to high-temperature superconductors, such high magnetic fields are indispensable to suppress superconductivity at low temperatures and thus to be able to examine the materials in the normal-conducting state. As was discovered more than twenty years ago, these substances normally begin to conduct current without losses at relatively high temperatures, i.e. in the easily accessible range of about -150 to -200 degrees Celsius. This is why they are predicted to have great technological potential for the future. We are, however, still lacking a basic understanding of these materials, without which their systematic use for new high technology is hardly possible. The Garching and Dresden physicists were now able to add a particularly important building block to that basic understanding. Predominant physical theories state that high-temperature superconductors are different from metals. Metals are usually conductive. This is due to the free electrons that flit through the crystal lattice at varying speeds, yet collide with other particles, which results in electrical resistance. The speed at which electrons move through the crystal lattice in different directions is described by the so-called Fermi surface. For high-temperature superconductors, this standard theory of metals was questioned and it was assumed that they have much more complex properties. The experiments at the Dresden High Magnetic Field Laboratory have now proven, however, that high-temperature superconductors do indeed behave like metals. The proof: all the samples have a Fermi surface. It had previously been assumed that well-defined Fermi surfaces would not occur in high-temperature superconductors even when superconductivity is suppressed. The scientists also observed that the Fermi surfaces do vary dependent on the doping. In future measurement runs the researchers want to find out why exactly the Fermi surface changes with the doping and how precisely the metallic, superconducting and magnetic properties interdepend. They also hope for answers on the exact nature of the superconducting state. Only then will it be possible to produce taylored high-temperature superconductors for broad future technological use.